Volume 1 of a historical series about Vivec and the Empire. 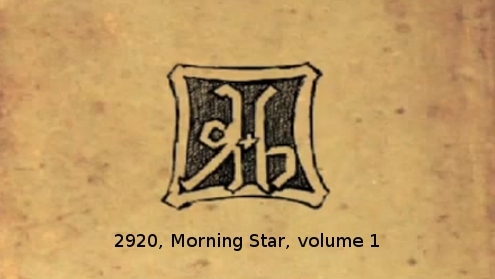 Number #12 2920, Morning Star, v1 by Carlovac Townway. This book is volume 1 of a historical series about Vivec and the Empire. It is found throughout many places in Skyrim. In Skyrim this book gives the reader one skill level in One-handed. Jorgen and Lami’s House (Morthal). Lost Echo Cave (Falkreath Hold). “I’ll leave today,” she said, simply. The chimes proclaiming South Wind’s Prayer echoed through the wide boulevards and gardens of the Imperial City, calling all to their temples. The Emperor Reman III always attended a service at the Temple of the One, while his son and heir Prince Juilek found it more political to attend a service at a different temple for each religious holiday. This year, it was at the cathedral Benevolence of Mara. The Benevolence’s services were mercifully short, but it was not until well after noon that the Emperor was able to return to the palace. By then, the arena combatants were impatiently waiting for the start of the ceremony. The crowd was far less restless, as the Potentate Versidue-Shaie had arranged for a demonstration from a troupe of Khajiiti acrobats. As soon as he saw the two warriors enter the arena to the roar of the crowd, Emperor Reman III remembered that he had agreed to this several months before and forgotten about it. One combatant was the Potentate’s son, Savirien-Chorak, a glistening ivory-yellow eel, gripping his katana and wakizashi with his thin, deceptively weak looking arms. The other was the Emperor’s son, Prince Juilek, in ebony armor with a savage Orcish helm, shield and longsword at his side. When Savirien-Chorak was rearing back to begin another series of blinding attacks, the Prince kicked at his tail, sending him falling back momentarily. In an instant, he had rebounded, but the Prince was also back on his feet. The two circled one another, until the snake man spun forward, katana extended. The Prince saw his foe’s plan, and blocked the katana with his longsword and the wakizashi with his shield. Its short punching blade impaled itself in the metal, and Savirien-Chorak was thrown off balance. The Prince’s longblade slashed across the Akavir’s chest and the sudden, intense pain caused him to drop both his weapons. In a moment, it was over. Savirien-Chorak was prostate in the dust with the Prince’s longsword at his throat. “The game’s over!” shouted the Emperor, barely heard over the applause from the stadium. “Oh, I’ll remember that,” nodded the Potentate. “Why don’t you wear that green gown I gave you?” asked the Duke of Mournhold, watching the young maiden put on her clothes. “It doesn’t fit because you’re getting fat,” laughed the Duke, pulling her down on the bed, kissing her breasts and the pouch of her stomach. She laughed at the tickles, but pulled herself up, wrapping her red robe around her. The Year Continues in Sun’s Dawn.